Everyone seems to cite one source for tailgating demographics. I for one, do not agree with the statistics. 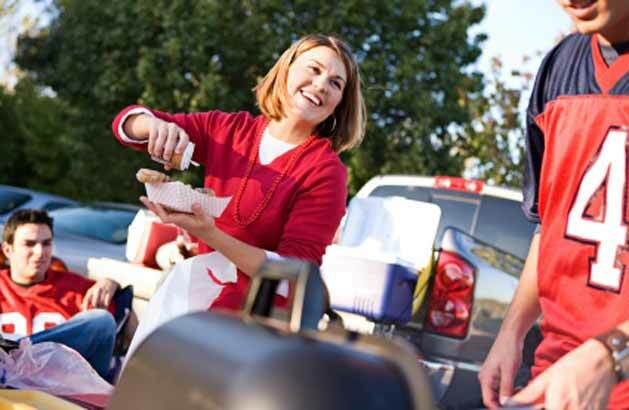 According to "The Commish of Tailgating" only 18% of tailgaters are women! What?! Maybe that held true in 1995 or even 2005, but that number has definitely changed. I started this blog in 2011 because I noticed the ever increasing popularity of women who were tailgating. I also wanted to give more women the opportunity to get involved with the hobby by highlighting easy recipes that can translate well for game days and gameday fashion has way more potential past the typical jeans and t-shirt. I believe tailgating is appealing to more and more women based on the fact that there is such a social aspect to it. I've always said that tailgating is really a big party outdoors and most women I know love to plan parties. I also think more and more women are getting behind the grill too. The facts are that women do appreciate sports more than we are credited for and tailgating does goes hand in hand. I would love to see another study or survey done that accurately reflects the current demographics and statistics. For now, if you agree or disagree I would appreciate if you left a comment below. Are more women tailgating or do you believe that 18% is a correct figure? Thanks!